Alyson McGillicuddy, a local member of Maine Agri-Women, recently participated in a special trip to the U.S. capital that allowed her to expand her advocacy work for Aroostook County farmers and meet other women who share her passion. 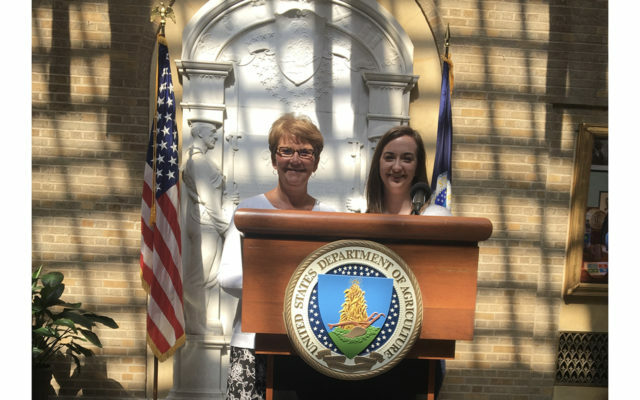 PRESQUE ISLE, Maine — Alyson McGillicuddy, a local member of Maine Agri-Women, recently participated in a special trip to the U.S. capital that allowed her to expand her advocacy work for Aroostook County farmers and meet other women who share her passion. McGillicuddy, along with Maine Agri-Women President Pam Townsend, attended the American Agri-Women Legislatie Fly-In from June 3 to 6 and met members from all 50 states who actively promote agricultural-based education in local classrooms and advocate for legislation that benefits farmers at both the state and national levels. McGillicuddy grew up on a three-generation potato farm in Hodgdon and is now an accounting associate at the Presque Isle location of Farm Credit East, a member of the national Farm Credit System that provides financial services to area farmers. She has been interested in politics from an early age and remembers an eighth-grade classroom visit from a state senator as one that inspired her to help make state and national legislators aware of issues that affect local farmers. During the legislative fly-in, McGillicuddy met with senior leaders from agencies such as the U.S. Department of Agriculture, the Environmental Protection Agency and the American Petroleum Institute and discussed topics ranging from international trade, renewable fuels policies, how immigration reform impacts the agricultural workforce, and how the 2018 Farm Bill — which had not yet been enacted at the time of the fly-in but has since been passed — could affect crop insurance and research funding. McGillicuddy won a $500 scholarship that covered the registration fee and other trip expenses and which is given to Agri-Women members who have never attended the legislative fly-in. She said that the most eye-opening experience for her was seeing how invested the agency leaders are in helping farmers across the country and in learning from the perspectives of the various Agri-Women members. For McGillicuddy, who joined Maine Agri-Women in January 2018, the trip offered her a chance to connect with and gain friendships with other women in the agricultural field. In the future, she hopes to participate in the American Agri-Women’s national convention, held in a different state every year, and learn about various farming practices and advocacy tools that can be applied to agricultural fields in Aroostook County. “It was great to be able to making lasting friendships with other women in the farming industry and know that we were all there for a common goal,” McGillicuddy said.